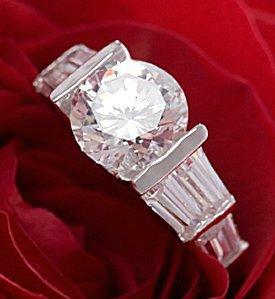 Accented floating diamond engagement ring. For couples interested in a simple engagement ring with modern flair, floating diamond engagement rings offer a timeless, distinctive look. The term "floating" refers to diamonds that are literally suspended within the ring setting so they appear to float in place rather than be held by numerous prongs or channels. In contrast to traditional settings which are obviously supported from below by claws or clasps, floating diamond engagement rings use open, elevated settings that highlight the beauty and simplicity of the diamond rather than concealing it within more constrictive engagement ring settings. While the idea of the gem floating is actually an illusion, these settings offer simple elegance and traditional appearances coupled with contemporary style and minimalist design. Floating settings are relatively new types of designs. Only in recent years has jewelry manufacturing tempered alloys strong enough to clasp a diamond or other semi-precious gemstone firmly and securely in the setting without exerting too much force, which could damage the jewel. In contrast to past decades when ever more elaborate designs were desirable, today's brides-to-be are increasingly opting for classic, simple rings. Floating-style rings offer that simplicity without reverting to vintage or antique styles, while still leaving room for personalization and individual flair. Tension Settings: These are the most popular and simplest form of floating setting. The gemstone is literally held between the two halves of the ring's band by the tension of the metal. Floating Arches: An elaborate design blends an eternity ring with an elevated setting by floating the central stone on arches or a bridge above a diamond studded lower band. Bar Settings: Bars of metal hold the center stone tightly, perhaps separating it from accent diamonds or other design elements in the ring's band. Open Bezels: Simple bezel settings can be created with an open, airy base to suspend the diamond above the ring. Split Shank Floats: As the ring's setting elevates above the band, the split shank embraces the sides of the stone rather than connecting to it. Bypass Rings: Instead of the two sides of the ring being centered on the diamond, they actually pass by the stone and grip it perpendicular rather than parallel to the finger. In addition to setting variations, floating diamond rings can also incorporate many other design elements to create stunning rings any woman will adore. Accent gems, contrasting metals, coordinated bridal sets, engraving, and other embellishments are all possible. As these designs grow in popularity, more jewelers and engagement ring stores are carrying different designs. Nearly all merchants will offer tension settings, though designer engagement rings frequently have more unusual options. When choosing a ring, however, it is important to take care judging diamond quality to be sure it is a suitable ring. Because of the open nature of the design, exceptional diamond clarity and diamond color are essential, since these characteristics will be immediately noticeable. The carat weight is less critical because that same open design will enhance the gem's size. The setting itself should be secure and even, without twists or skews that could become loose. 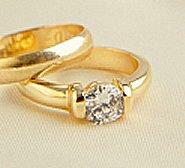 Floating diamond engagement rings should also have guards to protect the stone's point as well as the wearer's finger. Many designs incorporate a thin rim in line with the ring's band, but if this is absent, the stone should be sufficiently elevated that it will not rub along the finger when the ring is worn. Unusual engagement rings always require unusual care. Floating rings are difficult to resize and should be measured carefully for a proper fit, and the ring should never be forced if it is too tight - even a slight adjustment in the tension could loosen the diamond and lead to an unfortunate engagement ring mishap. To keep the diamond as clean as possible, soak the ring in the appropriate jewelry cleaner to be sure no dirt or debris is lodged along the tight setting. As with any engagement ring, a floating diamond ring should be removed during sporting activities, housework, while swimming, or while there is any possibility that the ring could snag or be lost. Floating diamond engagement rings are stunning illusions of light and sparkle reminiscent of classic designs but incorporating a distinctive modern flair. With many styles available, any bride-to-be will be floating on air even as a luxurious diamond floats above her finger.